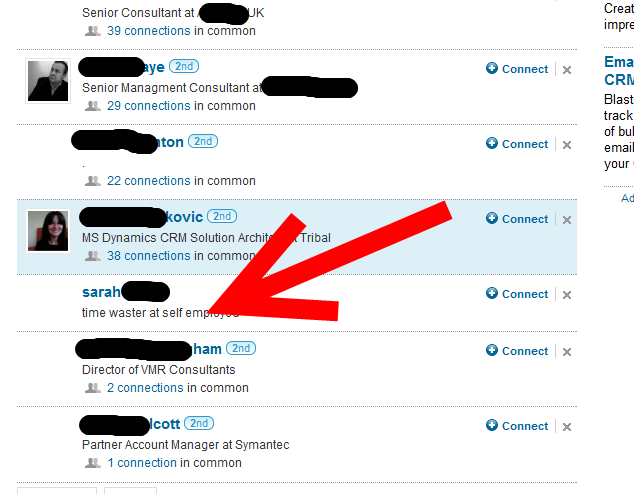 Is LinkedIn getting data from Facebook? I try and keep my online activities separated. LinkedIn is focused on my professional information and contacts. Facebook is totally focused on my close family contacts and twitter is mainly focused on my techie comments with some minor personal comments thrown in. To my utter astonishment today I was updating my LinkedIn contacts and I saw, in the “People I may know” section my Cousin. Now I have Zero professional contact with her. She is a semi-retired professional writer who has probably never heard of CRM in her life. We have zero shared connections in LinkedIn and zero shared groups. So how did LinkedIn connect me to her. Well the ONL Y connection I have to her is through Facebook. I don’t have her email address in my contacts, she doesn’t, to my knowledge have a twitter account I can think of no other mechanism other than my Facebook data is leaking into LinkedIn a scenario I am NOT happy about! Just thinking, any second level connections, are you connected to a sibling or relation that is connected to her? Or maybe through a connection that has private connections like a recruiter? I’ve seen similar LinkedIn suggestions which were quite fishy and seemingly unconnected, but I’m not a big facebook user so that was not on my suspect reason list. I had the LinkedIn social connector for Outlook installed for a while, and it definitely started suggesting people who I had no professional link to and I did not have them in my address book, but did send or receive emails to/from them, such as volunteers for a charity event I was organising. I also have a suspicion that it works both ways round – eg if I have the connector then when you send me an email it picks up on this and suggests you to me – and also suggests me to you when you next log on. So, I suspect in this case that either your cousin has your email address in her address book and has given LinkedIn the password to ‘helpfully’ check through that for connections, or she has the Outlook plugin installed. it has probably suggested you to her, she has not responded so it goes for second best and suggests her to you too. Hope they don’t also start working on the basis that if I send an email to person A and B they might know one another too. I also noticed this happening on LinkedIn. Creepy!